PORT OF GDANSK, POLAND: Upgrading of rail connections and other investments aim to enhance the city’s position as a cargo hub for central and eastern Europe. Poland is number two after Germany in terms of rail freight among EU member states. 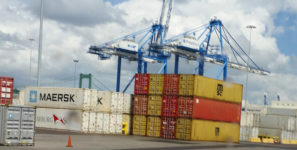 Within the next decade the volume of freight at Poland’s Port of Gdansk is expected to triple. Over 30 percent of the container cargo at the port of Gdansk is transported by rail. Investments by PKP PLK, Poland’s national railway infrastructure authority, aim to enhance the position of the port of Gdansk, Poland, as a major cargo hub for central and eastern Europe. Improvements targeted include the modernization of rail lines servicing the port, the construction of a new railway bridge across the Dead Vistula River, 10 bridges, four overpasses, and 10 culverts. This $135 million project also includes in total a 7.5 mile stretch of railway line between the Pruszcz Gdanski and the Northern Port) stations. By the end of this year, one track will have been launched on this line with a maximum speed of 60 mph. Along with this launch, the existing railway bridge will be demolished and work will begin on the construction of a parallel track, scheduled to be operational by August of next year. Rail connections in Poland, as in other European countries are becoming increasingly important, especially in the context of intermodal transport. Among EU member states, Poland is in second place after Germany in terms of handling rail freight. The Port of Gdansk is one of the most important logistical hubs in Poland, through which millions of tons of cargo are transported by rail every year. About 20 percent of the tonnage serviced annually at the port, over 30 percent of the container cargo, is transported by rail. Within the next decade the volume of freight at Gdansk is expected to triple. The largest element of the project is the construction of the bridge over the Dead Vistula, which will cost $38 million and will increase the traffic capacity of the railway to the right bank of the port six-fold. Improving the navigation conditions on the Dead Vistula is also on the drawing boards and will involve a five-fold expansion of the waterway. A second phase of the project will involve the design and construction of specialized equipment for railway traffic control and telecommunications.